Can You Guess Which Movies These Facial Mashups Belong To? Every director has his or her own distinct visual mood, but does that mood extend to what types of faces they cast? 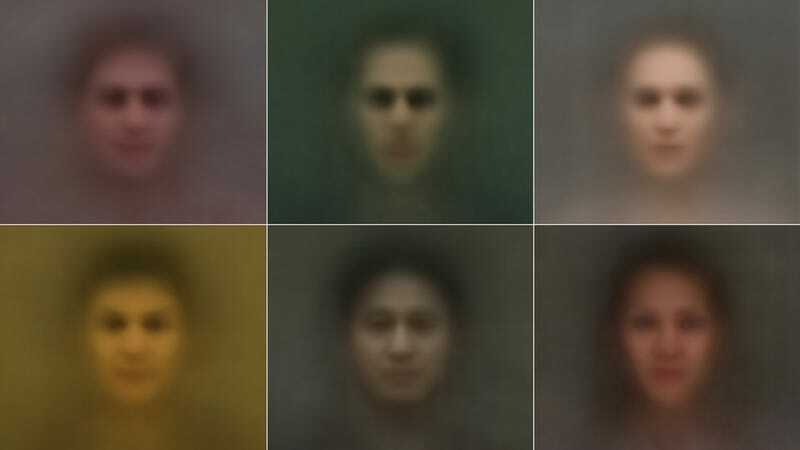 Based on data pushed through a facial recognition algorithm, these images shows us the aggregate of every face shown in a handful of blockbusters from the past few years. As you might guess, Avatar is very... blue. The series, Portrait, comes courtesy of Seoul-based studio Shinseungback Kimyonghun, a duo of two artists we wrote about earlier this year when they used facial recognition software to spot faces in the clouds. Like that project, Portrait uses an OpenCV algorithm to detect when a face appears on the screen (facing forward) during each film. Then, Shinseungback Kimyonghun compiled the frames (of which there are thousands, obviously) into a single image, which they overlaid onto a monochromatic background.